Rodeo Stampede (Free) was a game I adored when I looked at it in our review last month, and for good reason. The interesting mechanic of jumping from animal to animal whilst traversing obstacle ridden environments at pace was extremely compelling, and managed to create an accessible casual experience that contained a surprising amount of depth and strategy under the surface. 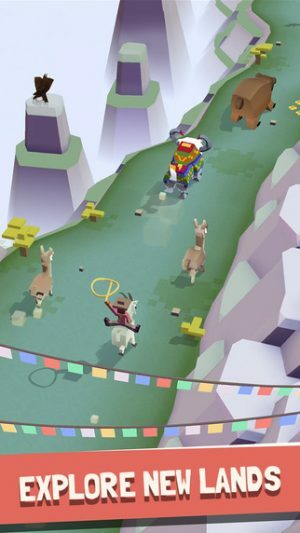 However, there was a core criticism that was levelled at Rodeo Stampede in our forums, even if it was a consequence of how enjoyable the game was – there simply wasn’t enough content. Exploring the Savannah and the Jungle was great fun while it lasted but, beyond that, there was little reason to return to the rodeo apart from to break high scores. Thankfully, this issue has been promptly addressed, as in a new update released yesterday, developers Featherweight Games have offered a whole new ecosystem to explore, as your cowboy avatar travels to the mountains to jump upon even more unsuspecting animals. In the latest 1.1 update, as well as having the new backdrop of the mountainous ranges to explore, there are 42 brand new animals in this region to befriend in Rodeo Stampede. These include a variety of new beasts, such as goats, llamas, and even yaks, which will certainly add some more variety to the game. This is accessible through normal game progression, so beyond potentially investing in the cash cow in app purchase to help boost your zoo’s income, this is an entirely free update that can be achieved through pure perseverance and the very best zoo maintenance. Finally, a new soundtrack has been added to the Jungle area to give it its own identity, which was one of my few burning criticisms that I am delighted to see addressed so early on in Rodeo Stampede‘s lifespan. From the map screen, this seems to be merely the first of many new habitat additions to Rodeo Stampede – even more locations and animals will only help cement the game as one of the must have arcade titles on the App Store at the moment. While many may be wondering whether an option to remove the forced ads will ever become a reality, this is a great start to Rodeo Stampede’s post-release support, and it will be interesting to see how the game develops and expands over time. Let us know your impressions of this new update on our forum thread.